If you’ve never been with a partner who was abusive, it might be easy to tell others who are enduring abuse: Just leave. Unfortunately for many survivors, it’s not that easy. Take the quiz below to see what you might not know about leaving an abuser. 1. Why are survivors of domestic violence often unable to leave their abuser? Answer: F. Survivors of domestic violence have a number of reasons for not leaving their abuser . Their reasons are real and complex and are more often than not because their abuser makes it impossible for them to leave. See more barriers to leaving here. 2. True or False? Money can keep someone trapped with an abuser. Answer: True. Concerns about the ability to financially provide for themselves and their children often keep survivors dependent on their abuser. Research shows that financial abuse is a factor in up to 98 percent of abusive relationships and it is the leading reason for a victim staying in or returning to their abuser. Financial abuse takes many forms, but to gain financial control, an abusive partner might forbid their victim to work or sabotage their employment opportunities. Controlling how money is spent, not allowing a partner to have access to bank accounts or credit cards, hiding assets and refusing to pay bills to ruin a partner’s credit score are other ways an abuser might inflict financial abuse. 3. How many times, on average, will a survivor leave their abuser before they successfully break free? Answer: C. Seven times is widely quoted as the average, however, most experts say that leaving an abuser is a hard-to-quantify process. From the beginning, a survivor counteracts abuse by relinquishing parts of self, minimizing abuse, and fortifying their defenses, and that work of counteracting abuse prepares the survivor for testing the exits multiple times in the process of breaking free. 4. About how many homeless families say that domestic violence is the immediate cause of their homelessness? Answer: D. Homelessness is a potential reality many survivors face when trying to leave their abuser Roughly half of all women who are homeless say that domestic violence was the immediate cause of their homelessness. If you feel you may be facing this, talk to a domestic violence advocate about your options and develop a safety plan. 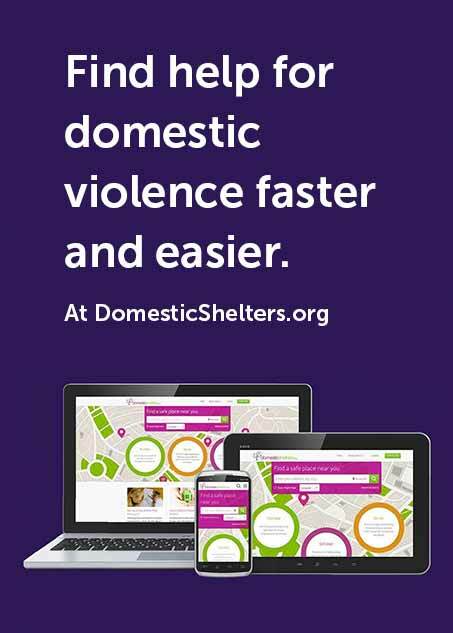 To find a local advocate or connect with nearby shelters, visit DomesticShelters.org. 5. True or False? When a woman tries to leave their abuser, her risk of being killed increases. Answer: True. According to a National Institute of Justice report, in 45 percent of intimate partner homicides in which a man killed a woman, her attempt to leave the relationship was the precipitating factor, underscoring the risk of leaving and the importance of safety planning.